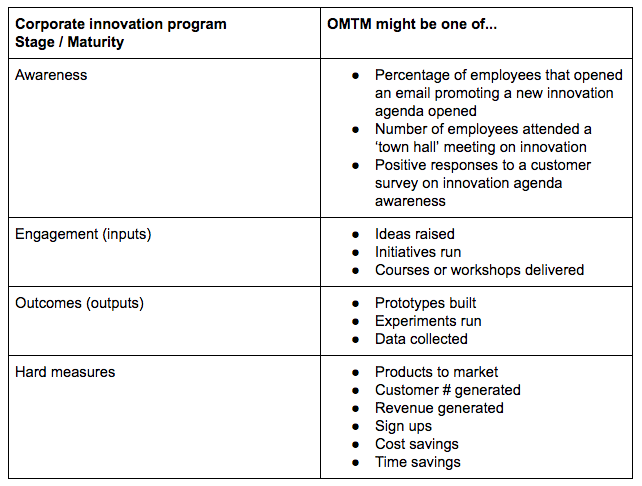 But with most corporate innovation initiatives quickly degenerating into theatre, failure rates are running high (eg. 80–90% of innovation labs fail). Such failures ultimately lead to senior stakeholders withdrawing their support while intrapreneurs become increasingly dissatisfied and leave the organisation to seek out greener, more innovative pastures elsewhere. This really hurts a company’s prospects for innovating in the long-term — something few companies can ill afford in today’s climate. Startups searching for product-market fit today do so by rapidly testing a large number of assumptions underpinning their solutions and business models — essentially the lean startup philosophy at its core. They take this approach because when we’re developing something completely new, you won’t have all the answers and the surest way to figure them out and give yourself the best chance of surviving long enough to do so is to take small bets across these assumptions. All the ideas and good vibes in the world generated by a design sprint or a hackathon won’t matter if, after a number of years, the growth gap isn’t plugged, which basically suggests that the innovation program delivering any long-term sustainable, measurable, tangible value that your audience — I’m guessing senior executives and shareholders — care about. For example, are new revenues coming at the expense of something fundamental to the company’s sustainability — such as customer service, reputation and compliance with regulation? By defining and communicating your North Star Metric from day one, you are aligning the team’s long-term expectations and focus, and can monitor it on at least a quarterly basis in the early stages of your program, objectively answering questions such as “how likely is it that product X, Y or Z is going to materially plug the gap in 1, 3 or 5 years?”. By using a combination of NSM and OMTM, you’ll decrease the risk of support for initiatives being withdrawn early but also help avoid the possibility that you don’t find yourself five years in with all sorts of noteworthy input and output measures to report on but not having moved the needle on what matters most, plugging the Growth Gap.